The South African Tom Blomefield, himself a sculptor, is both the founder and the "good spirit" of the world-famous artists' village known as the Tengenenge Sculpture Community in Zimbabwe, the "big stone house" as it is called in the language of the Shona. 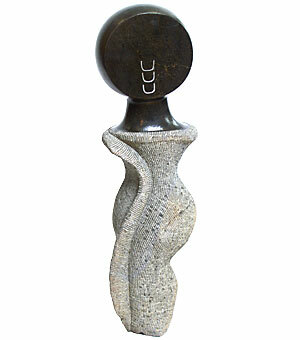 At Blomfield's initiative, the sculptors' cooperative developed from the middle of the 1960s onwards into a centre for the type of multifaceted sculpture which made stone sculptures, also known as Shona sculptures from Zimbabwe, famous far beyond the borders of the country. Today, Tengenenge can be called a fixed component of the contemporary African art world. Around 100 artists and their families live in Tengenenge today. Since it was created, well over 900 artists have contributed to the artistic biography of the community. In-ternationally recognised sculptors such as Henry Munyaradzi, Bernard Matemera, Fanizani Akuda, Edward Chiwawa and Josia Manzi - to name just a few - have their roots in Tengenenge, which literally means "the origin of the origin".